A new food-grade checkweigher that features robust construction and can function as a standalone workstation or be fully integrated with computer networks has been introduced by Alliance Scale, Inc. of Canton, MA. The Alliance/CAS Enduro Extreme Washdown Checkweigher features a 304 SS platter and base, integral load cell mechanical stops and four shock absorbing springs for overload protection up to 10 times its capacity. Designed to withstand high temperature and pressure cleaning to 1450 psi, it has a water tight indicator with a 4 mm thick one piece front housing, a double O-ring two-stage compression seal, and encapsulated circuitry. Available with 10” x 10” x 2”, 12” x 12” x 3”, and 15” x 15” x 3 platforms, the Alliance/CAS Enduro Extreme Washdown Checkweigher operates with a 12V rechargeable battery pack with a 50 hr. life and a five hour recharge time. The indicator is switchable between lb., oz., and grams and provides counting and totalizing with various hold modes. Communication options include RS232, RS485, wired- and wireless Ethernet, Bluetooth, and 20 mA. 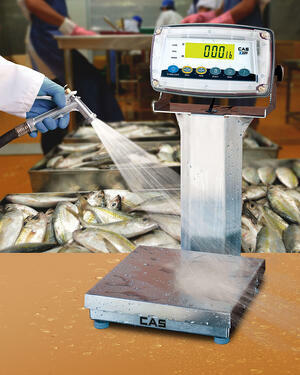 The Alliance/CAS Enduro Extreme Washdown Checkweigher is priced from $1,095.00 up, depending upon size and capacity. © 2016 Alliance Scale. All Rights Reserved.